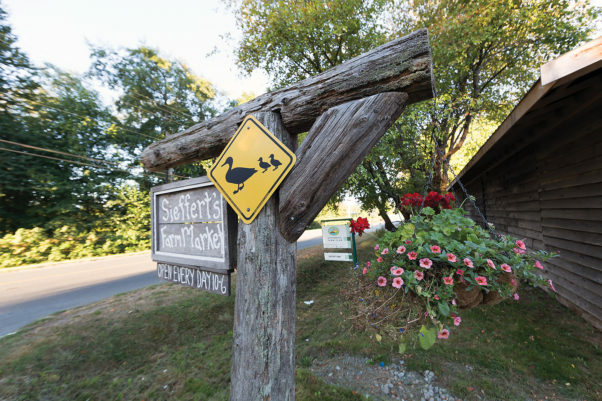 This September 25, visitors have an opportunity to experience popular Seiffert’s Farm Market in a different way—the farm is one of 22 stops on the 6th annual Comox Valley Farm Cycle Tour. Travelling by bike is a great way to take in a farm. On a bicycle, our senses are open. We smell the heady aromas of plants, food and farm; we feel the air on our faces; we experience the world at a slower pace… and we work up an appetite, creating more opportunity to enjoy the bounty along the way, and still (perhaps) go home and feast some more on products we’ve picked up. “The tour was developed six years ago in partnership with Comox Valley Economic Development and Tourism (CVEDS), the Comox Valley Cycling Coalition and the Farmers’Market as a way to welcome more visitors to the region, and especially to farms and food and beverage producers, while showcasing the area’s cycling assets,” says Lara Greasley, marketing and communications manager with CVEDS. The tour is self-managed and self-paced. Participants can be ambitious and choose to do the whole thing, which ranges from Black Creek to Fanny Bay, or they can choose a geographic area to cover, a representative sampling, or even a theme. A “shopping shuttle” is available to pick up purchases and deliver them to you at the end of the day, for a $5 fee. The tour offers a sample of the Comox Valley’s cornucopia of home-grown, home-made, home-served and home-marketed yummies. You can visit family farms with vegetables galore, berries, herbs both culinary and medicinal, sheep, goats, and cows; you can get a taste of the Valley’s burgeoning beverage sector at three different wineries, two breweries and a distillery; you can taste fresh oysters from the pristine waters of Baynes Sound and drink locally-roasted coffee; and you can browse to your heart’s content at retail outlets ranging from Weinberg’s at Buckley Bay to Seeds in Cumberland. Many of the featured destinations include activities, offering cyclists the opportunity to learn how to make a healing salve or experience the cow milking procedure. As well, the tour offers a great chance to chat with some the dedicated people who grow, harvest, make and sell our local food and beverages. This successful event has created its own momentum that, as it grows, is involving more and more of the community, including a Wine Tour on the Saturday offered by Ambassador Transportation. If you factor in the Farmers’ Market on Saturday, this becomes a complete weekend-long culinary and cycling experience.